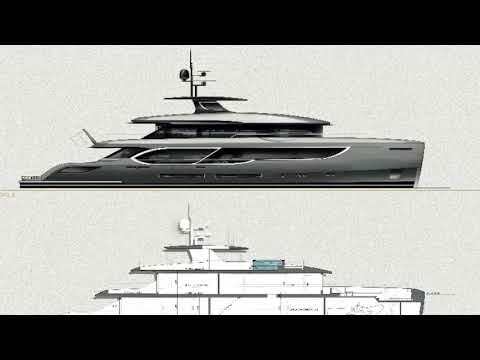 Italian yard Benetti Yachts has released a rendering based video providing a first-look tour around its Oasis 135. The yard has now finished the mould and is preparing to begin construction of the 40 metre yacht, which was developed in collaboration with British design studio RWD and will be built from GRP. 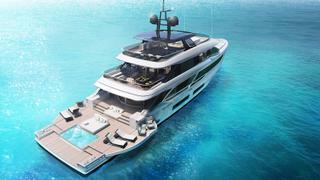 The renderings below show a spacious superyacht beach club, complete with fold-out bulwarks and a central infinity pool. Other key features include an al fresco dining area on the bridge deck aft, a 6.25 metre tender garage, and a superyacht sundeck shaded by a large hardtop. The interiors of the Oasis 135, which were developed by New York-based studio Bonetti/Kozerski, balance an overall feeling of informality with elegant and sophisticated elements such as leather and rosewood inserts. This theme is carried through to the superyacht wheelhouse, which has been designed as a place for guests to admire the view and study nautical charts without interrupting the crew's duties. Accommodation for up to ten guests is split between five staterooms, including a main deck master suite, two VIP doubles and two twin cabins. Meanwhile, the crew quarters is suitable for a staff of up to nine people. Power would come from a pair of MTU 12V4000 diesel engines for a top speed of 16 knots and comfortable cruising at 14.5 metres. When trimmed back to its optimum cruising speed of ten knots, the Oasis 135 would be capable of a transatlantic cruising range of 4,000 nautical miles, drawing on a total fuel capacity of 45,000 litres. 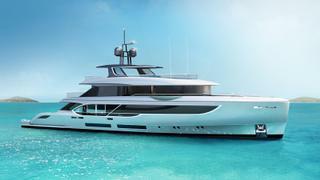 This is the latest project to spring from Benetti’s partnership with RWD, which has already produced the BNow range of superyacht concepts, measuring 48 metres, 55 metres, 63 metres and 68 metres.